SWING INTO SPRING SALE: Your Choice - (2 Year Warranty + SAVE $700) or (SAVE $1,000)! Ends April 30, 2019. 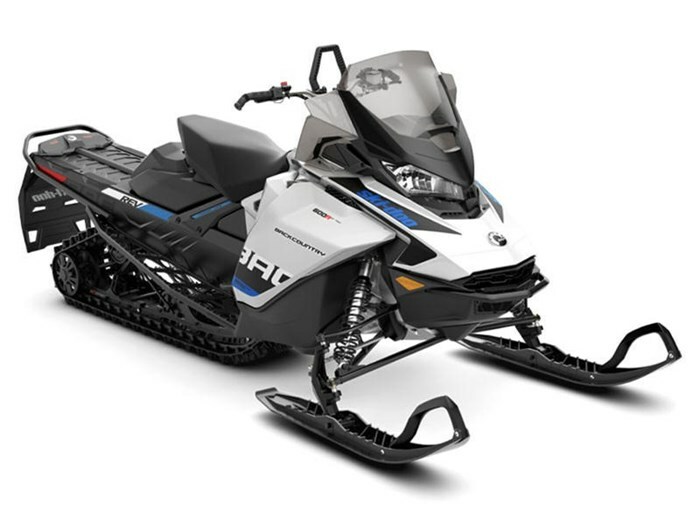 2019 Ski-Doo Backcountry™ Rotax® 600R E-Tec® White & Black ANY RIDE YOU CAN DREAM UP Ideally suited to be the highlight of winter, the 2019 Ski-Doo Backcountry mixes precision trail handling with deep snow features that let a rider explore beyond the banks of the trail. Features may include: ROTAX 600R E-TEC ENGINE INSTANT POWER. IMMEDIATE RESPONSE. Following its big brother Rotax 850 E-TEC engine's lead with second generation E-TEC technology, the Rotax 600R E-TEC engine offers a 30% improvement in throttle response**, crisp acceleration and sets a new 600cc class standard with 125 horsepower* while continuing to set the bar for reliability, and 2-stroke oil and fuel economy. PDRIVE CLUTCH QUICK, EFFICIENT, EASY A major factor in the quickness of REV sleds is the new pDrive clutch. Fast and friction-free dual rollers transfer torque in place of traditional sliding buttons on this 100% clutch. The oversize rollers with needle bearings, wide flyweights and shaft-on-shaft design emphasize smooth operation and long life. Ultra-responsive shifting, impressive RPM consistency and 2.8 lb./ 1.3 kg lighter than the TRA VII. REV Gen4 PLATFORM NEXT GENERATION OF A LEGEND The 4th generation of the REV platform is designed around aggressive trail riders with a narrow, compact package giving the rider more freedom to move and influence the sled. More centralized masses (especially side-to-side), light weight and industry-leading suspensions make the vehicle ultra responsive. CMOTION REAR SUSPENSION CROSSOVER CONTROL AND CARVING Crossover-specific suspension uses best principles of the rMotion trail and tMotion mountain skids for confident cornering and agile boondocking – such as rigid front and rear arms with excellent weight transfer. It also features a rising-rate motion ratio, like the latest generation of Ski-Doo rear suspensions, to provide superior control and comfort. Tipped rails enable better cornering, boost top-end speed and fuel efficiency. RAS 3 CROSSOVER FRONT SUSPENSION CROSSOVER PRECISION Unique geometry and steering on the RAS 3 for capability and light steering on and off trail. Optimized for crossover usage, two ski stance positions dial in handling: 40.1 in. (102 cm) or 38.4 in. (97.5 cm). OPEN TOE-HOLD LET IT HANG OUT Enables rider to naturally pivot their outside foot outward in aggressive cornering. HPG PLUS SHOCKS PLUSH PERFORMANCE Highest quality aluminum-bodied high pressure gas shocks by KYB. Rebuildable and revalvable. 15 X 146 X 1.6 COBRA EXCELLENT TRACTION ANYWHERE This track features combination of flexible cupped lugs for superior off-trail performance and more rigid lugs for added traction on hard-packed snow.